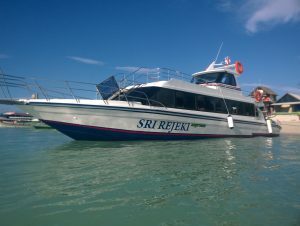 Sri Rejeki Express is a new comfortable boat transfer between Sanur beach and Nusa Lembongan Island in sunny Bali, Indonesia. 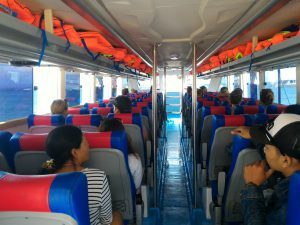 Owned by a group of “fishermen” which has stood up since 1974 in Sanur Beach called DEWI SATAYOJANA GANDHI Express has a top speed of 30 knots which will ensure a fast and comfortable boat ride to Nusa Lembongan Island in 30 minutes. Their friendly staff will help you board the with ease and aim to provide the highest level of Indonesian hospitality. How works if I buy online? I have to show the ticket in the harbour before get on board? Do you send me e-ticket? Yes, you will get e-ticket immediately after you finish the payment. E-ticket must be shown while boarding. Husa Lembongan has harbor/terminal called Jungut Batu. Do you guys allow luggage on board? Any free transportation from hotel in Lembongan to Lembongan Ferry terminal, and from Sanur ferry terminal to hotel? Yes, Sri Rejeki Express usually have drop service to the Hotel around Jungut Batu. Do you also provide pick up service from seminyak? Hi Hardik, you can check the list of available pickup area through booking form. Thanks. Please what is the place where we take the boat. It’s for give to the taxi.